For my Transmedia figure, I decided to chose the infamous Ron Burgandy from the movies Anchorman and Anchorman 2. Ron Burgandy, played by actor Will Ferrell is an American icon and known nationwide. While Ron entertains us on the big screen, he also stays in character in out of movie context. I will be focusing on how Ron interacts with his fans with TV appearances on major networks as well as look at his Twitter handle. 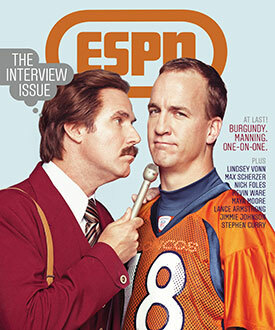 Will Ferrell was featured on both ESPN as well as an interview on the talk show Conan. The twist is that he was not on the shows as Will Ferell but instead as his character of Ron Burgandy. While on the shows he acted and portrayed actually being Ron. The things he said and the way he interacted represented the character and further created the character of Ron as well as promoting the sequel to the first Anchorman. While in character on the shows, he constructed his personality and almost brought this fictional character to life as if he was a real person. For people that have not seen Anchorman, Ron is in fact an news Anchorman who is very outspoken, spontaneous, as well as a ladies man. Watching him on Conan, it almost seemed like Ron Burgandy and Will Ferell were two different living people. The character of Ron Burgandy is a comical one who people look to for a good laugh. There is a twitter just for him which spits out tweets that are both very humorous as well as promotional for trying to get people to watch and purchase the films. Jenkins, Henry. “Transmedia Storytelling 101.” Confessions of an AcaFan. N.p., 22 Mar. 2007. Web. 27 Feb. 2014. <http://henryjenkins.org/2007/03/transmedia_storytelling_101.html&gt;.